Our first show of 2016 took place on the 9th April, the Poole Vikings club’s annual show. 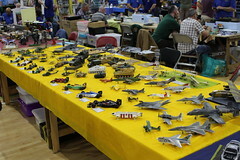 This was our third year attending, and for this year, the show marked the debut of our latest display. 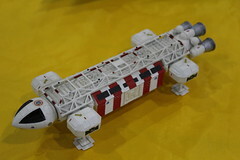 Featuring as many Star Trek models as we can, we’re marking 50 years of this hugely popular science fiction franchise. Whilst our display at the weekend was somewhat unfinished, by the time our next appearance on the show circuit comes around in two weeks’ time at Milton Keynes, you can rest assured it will look even better! As well as the display however, we’ve also dispensed with our regular green club shirts, and replaced them with a uniform that befits an Enterprise’s crew! Clearly our efforts made an impression on those at the show, as we ended up being awarded with the Best Visiting Club Display trophy. Very nice indeed, and our gratitude goes out to everyone at Poole Vikings for inviting us, and putting on an excellent event. In addition, Martin and Sam were delighted to pick up ‘highly commended’ certificates for entries into the various competition categories! If you haven’t attended the show before, we highly recommend it. 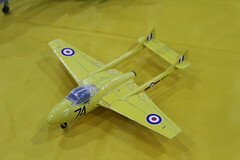 Always friendly, and with some outstanding models and displays on show, there’s a reason we keep coming back every year. Now we’re just waiting for 2017! See below for more photos of our stand from the event.